Not sure if I use the right words to describe my problem, maybe you can help. Feel free to ask for more information and thanks in advance for your help! 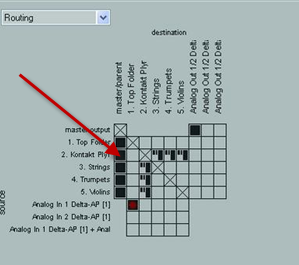 Yes, you can route several channels to one instance of the Kontakt player. I've been through this exercise. The threads at the links below might help. Hello paccer and welcome to these forums. You'll find many helpful people here and a lot of useful information. Make sure that you purchase Nicholas' excellent User Guide and ReaMix docs too. Worth their weight in gold. If you can, get hold of a copy of the Computer Music Beginner's Guide Special #32 - it's full of tutorials for beginners, using Reaper. I don't think it's a stupid question. It took me ages to work out how to do it, plus I got some help from the forum. Post again if you need any more help. seems to work now with several channels in one Kontakt Player,,, cool. 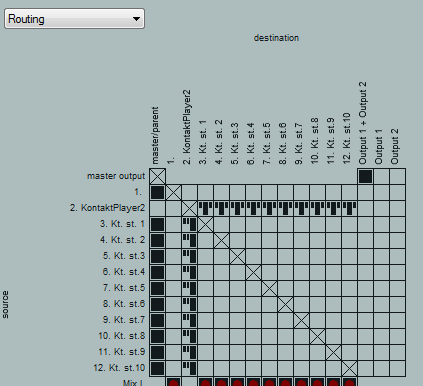 Although I haven't finally understood how the Audio routing is working (and why!). The three audio output tracks each carry the full audio of all Midi tracks. Is there a way to separate them to individual audio tracks to mix them down individually?? Another thing. Is there a kind of "MIDI Reset" buttton? Haven't found any and after recording, my MIDI signal keep up and not being cut to zero, until I start a new playback.. Yes you can separate them into individual audio tracks. It might take me a while to do it, but I'll try to post some more info on the routing as soon as I can, including how to set up the Kontakt Player 2 for multiple stereo outs. I've been meaning to write it all down for some time, so I don't forget. I don't know the answer to the MIDI reset question. Maybe someone else can help with this one. Last edited by stratman; 04-26-2009 at 06:05 AM. I would be very interested in what you would post as I recently got Garriton JABB and I'm still in the process of setting it up properly. A good tutorial for Kontakt Player 2 in REAPER is needed. Below is a link to a pdf containing some notes I've written on using GPO Kontakt Player 2 as a multi in Reaper. 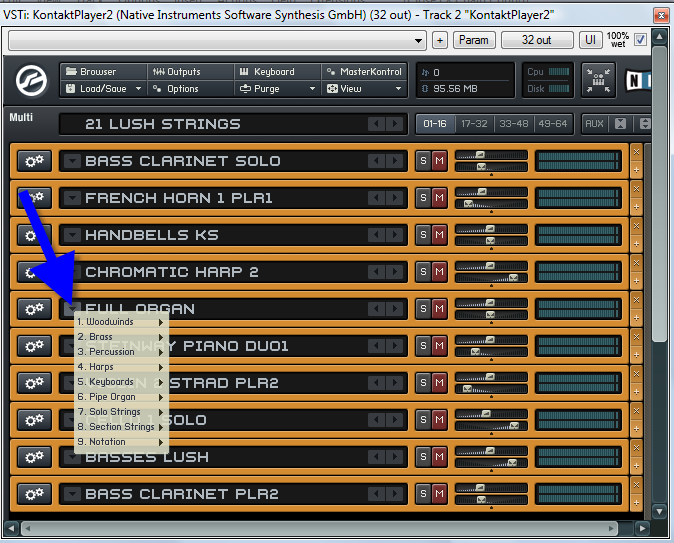 But the notes are probably relevant to any multi in Kontakt Player 2 (KP2) and Kontakt 2 (K2). I needed to write it down, otherwise I know I'll forget in a few months (it must be my age) . It might be of use to someone else out there. Let me know if you spot any errors or if you know of a better way. There are a lot of pages, but it's mostly pictures. Also, it's much easier to do in practice that in looks when it's written down. edit: I've already spotted a typo on the first page. Sod it, I'm not going to change it yet. edit (30th Jan 2010) the third part of the pdf above describes Feedback Routing. I'm no longer sure that this is a good approach (see links below). Instead of feedback routing, I now use separate tracks for the Midi and the Audio. Once the Multi has been created, the routing can easily be built from the items listed under Options in the Fx window. It results in double the tracks but, to make things look tidy, tracks you don't want to see can be hidden. edit (28th Feb 2010). It's easier the build the routing than explained in the pdf note. Instead to build the outputs and midi inputs, in the Reaper Fx options click on "Build multichannel routing..." then "Build 16 channels of MIDI ..."
That's a good tutorial! A "connect-the-dots" routing guide even I can understand. Only one small comment: on p. 17 shouldn't the folder have an "end the track" folder set, either on track 12 or on a new track 13? Is there a way to send you a few dollars thru PayPal as a thank you? Here's another question that I probably should be asking on the Garriton forum but does anyone know if individual instruments (or groups of instruments) in a kit can be routed out to tracks? For example, can I route out the bass drum and the snare stir from the JABB Brush Drum Kit onto separate tracks like in your tutorial? You can do this easily in Kontakt 2 because you can see the samples in the mapping editor and set them to different Groups. Then assign the Groups to different outputs. Unlike Kontakt, the Kontakt Player seems to be much more limited in this respect and the above option doesn't seem to be available. 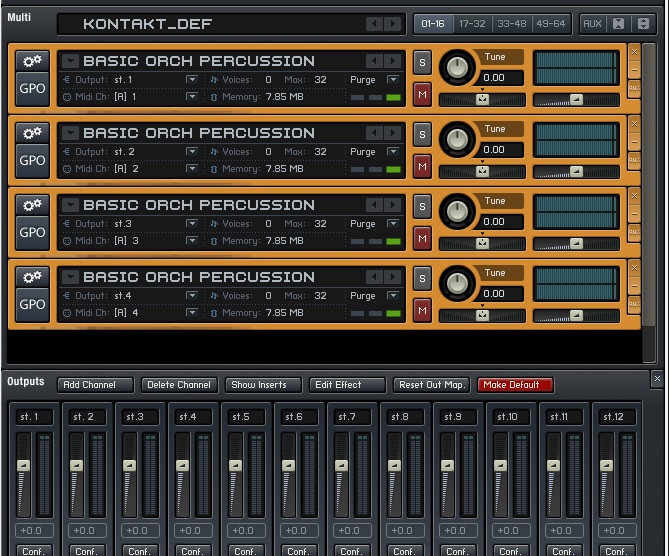 However, I can think of a cheat way of doing this with the Kontakt Player 2. Maybe there's a better method. I don't know. Load up KP2 as a multi. Now load multiple instances of the drum kit. I don't have a drum kit in GPO, so I tried it with Orchestral percussion. 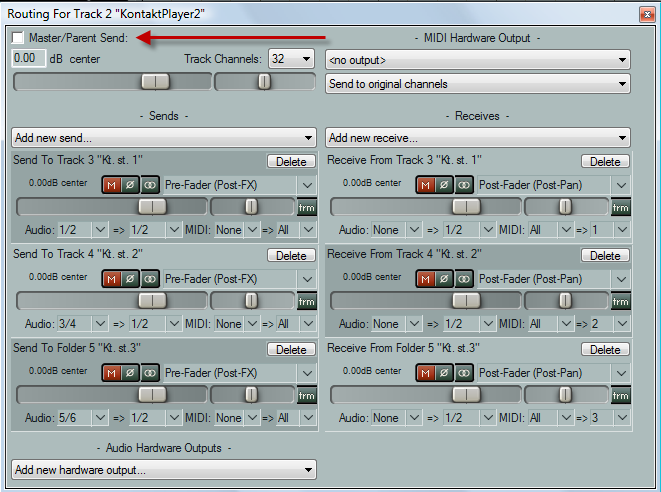 Set up each instance with a different output and midi channel (see picture below). 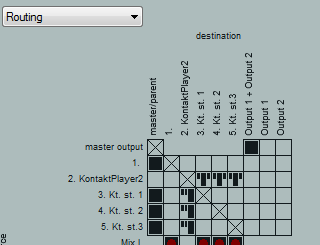 Now insert a midi item in the Reaper track hosting KP2. Program in the part, but where you want the drums to appear on different outputs, in the Note Properties use different midi channels. If using multiple instances uses too much memory, you could always play the track through then do a purge in KP2, which will remove the unused samples in each instance. Last edited by stratman; 04-26-2009 at 03:59 PM. Got it working just fine. But I don't understand why feedback needs to be allowed when the tracks are not feeding anything back to the Kontakt folder? But it certainly does not work unless feedback is allowed. Is this a bug? Or is it because the "Master/Parent send" is checked in each track? Last edited by merdave; 04-27-2009 at 09:03 PM. ...I don't understand why feedback needs to be allowed when the tracks are not feeding anything back to the Kontakt folder? But it certainly does not work unless feedback is allowed. Is this a bug? Or is it because the "Master/Parent send" is checked in each track? merdave, are you referring to your question at post #11 and my response in post #12? For that particular case I don't have to enable feedback, if I set up the multi in a folder where the first track in the folder hosts the VSTi (see picture below). If I don't put everything in a folder, for some reason, I get glitches on my computer, which is something I don't understand. Last edited by stratman; 04-28-2009 at 12:47 PM. I had another option in JABB that I used instead. The Brush Drum Kit was also already presented in parts: bass drum, toms, snare, cymbals and hihat. So I was able to stick close to your tutorial. I also added a bass and side-chained it to the bass drum with ReaComp. What I don't understand is this: since the only thing happening is audio being fed from the Kontakt track to the other tracks and no audio or MIDI is being returned to the Kontakt track, why the need for feedback? But it doesn't work for me without feedback enabled, so I'm puzzled. What am I overlooking? Again, thanks for your help. I looked all over the net and couldn't find a link for the Kontakt 2 Player user manual or other info. like you put in this Reaper tutorial. PS Yes, I put everything in a folder like your post above but it doesn't work for me without feedback enabled (in Reaper 3beta7). BTW, 3beta7 is working great so far; 3beta6 was giving me some blue screens so I'm really happy to see Reaper stabilized again! Last edited by merdave; 04-28-2009 at 11:50 PM. -- route the KP mixer channels to the KP2 outputs (section 1.4. Perhaps you could compress a simple problem project file (no samples needed) into a ZIP file and post it here as an attachment so we can have a look at it and see what's (not) happening? In XP, right-click the project file, select Send To ... compressed (Zipped) folder). click on [Manage Attachments], browse to your ZIP file, select and Upload it. Yes, I agree with DarkStar. If you post your file we could have a look at it. As a matter of interest, what does your routing matrix look like? For me, it looks like the picture below for the example I give in my pdf at post #10. I’d be happy to PM you an example Reaper file or track template, but I’m not sure how it would translate at your end. I’m a bit worried about it crashing your system. 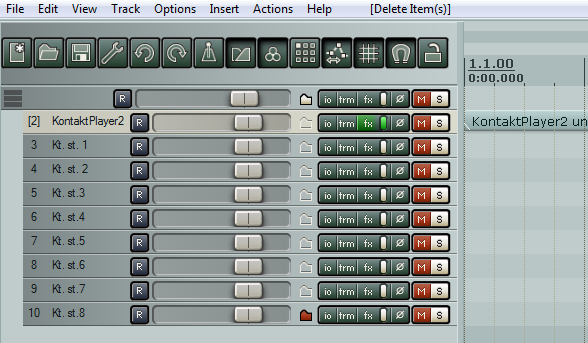 When you loaded it did you use 'Insert virtual instrument on new track' as shown in the picture below? For three tracks I would have the following 'io' settings in the track containing the Kontakt Player (see picture below). Are your settings exactly the same as this? I see you've only got three tracks set up. Is that the total number of instruments you want to use? Last edited by stratman; 05-02-2009 at 10:25 AM. Damn, seems as I am too dump for this! By the way, I very much appreciate your help Stratman! Last edited by paccer; 05-03-2009 at 12:26 AM. Ray, I've emailed you, so you can go back and edit your post to delete your email address. I've read your very detailed posts regarding setting up multi-tracks with one instance of GPO but I just don't get it. Does anyone have a template specifically for GPO? Or an extremely simple (newbie) procedure. Thanks! What version of GPO are you using? I'm using Version 3.0. I happy to post a template but, unless you've got the same version as me, my template won't work. Also, the instructions are for a version that uses the Kontakt 2 Player. GPO version 4 uses a different engine, so the KP2 instructions won't apply. Thanks for the reply! I'm not at home right now but I think it is 3. I got it about a year or so ago. Below is a link to a Reaper file that should give the set up for a 10 output multi for GPO Version 3.0. I've posted the Reaper file to make sure that you've got the correct Project Settings. Bear in mind that feedback is enabled in the Project settings to get it to work, so use it with caution. You can save the track template yourself if it works. I selected the GPO instruments randomly. 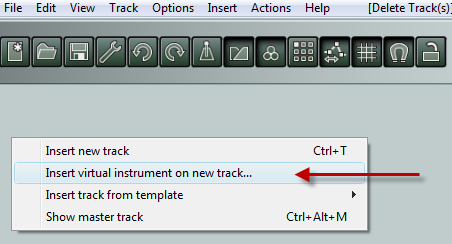 To change the instrument, click on the 'fx' button on track 2, then click on the down arrows (see example in the picture below). This method should avoid messing up the midi channel settings. I've no idea whether this will work on your computer. Use at you own risk and let me know how you get on. Last edited by stratman; 09-14-2009 at 03:15 PM. I'm going to check it out and see if it works. I'll let you know. I just can't seem to get it. I saw a post by Rex who has a template similar to what I'm able to setup but I can't get the midi to work on more then one channel. Frustrating!! What happened when you tried to run my Reaper file from post 26? What version of GPO are you using? edit: I downloaded a template from Rex from the link below. Is this the one you used? It didn't load GPO for me so I think I must have a different version. Also, looking at the Reaper project, there seem to be almost twice the number of tracks than are really needed. Maybe this was done to avoid enabling feedback or something. It's not the way I do it. Last edited by stratman; 09-17-2009 at 11:04 AM. I don't have experience with the Kontakt player 2. Did you try downloading and opening my Reaper file from post #26? Yes I did. I can't get the midi to work on all of the tracks. I guess I really just don't know what I'm doing. So did it load up GPO OK? Also, when you play the file you should get the instruments sounding on track 3, then track 4 , then track 5 etc. Did this happen when you played it? GPO loaded ok. How do I load individual instruments? When you open the Reaper file, GPO should load up with some instruments that I'd set up. When you play the file you should hear what the mp3 plays in the link below. Do you hear this when you play the Reaper file? Which file do I need to load? Sorry for being such a pain. The Reaper file at the link below, which is from my post 26. I'll send you a Private Message, with my email address. Email me, so we can sort this out off-line. But it's midnight here, so I'll probably have to get back to you tomorrow. I'll try this file and let you know. THANKS! I have an existing project with audio tracks already recorded. When I try to add Garritan Personal Orchestra and the new Aria player, it crashes Reaper before the VSTi gets loaded. Reaper just hangs and Windows Vista tells me Reaper has stopped working. If I load the Garritan Aria VSTi in a new project, I don't have the problem and it works fine. I'll certainly figure a work-around for my existing project, but wanted to post to see if anyone else has this trouble.